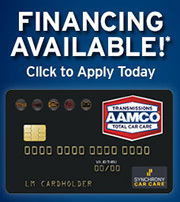 At AAMCO of Henderson, we know transmissions inside and out. Our expert technicians can diagnose and fix virtually any transmission problem offering honest assessments and skilled repairs every time. Whether you have a minor transmission problem or an issue requiring a replacement or rebuild, we'll make sure that you're informed of all of your repair options. We will never recommend a repair that is more costly than what you need. It's why more than half of our transmission repairs are minor—with no rebuild or replacement needed. To begin your transmission service, we'll take steps to pinpoint the exact source of your transmission problem. We will check and replace your engine fluids, including transmission, differential, and transfer case fluids. We will then take your vehicle for a test drive to experience any issues you have reported firsthand. Beyond your test drive, a technician will place your vehicle on a lift and inspect a variety of components. We will be looking closely at shift linkages, cables, vacuum connections, harness and ground connections, mounts, U-joints, CV joints, pan gaskets, wires, and any other component that could impact the performance of your vehicle. In many cases, a problem that seemingly involves a transmission turns out to originate with some unrelated component. At our car care centers, you can expect to be fully informed of any repairs beyond your transmission that your vehicle should need. Today's computer-controlled vehicles require more than just a visual inspection; they demand thorough diagnostics from the latest in electronic equipment. At AAMCO of Henderson, our electronic scan service is second to none. If your vehicle's computer system is sending the wrong signals to your transmission, we will pinpoint the problem and provide any needed repairs. Our exclusive computer scan service begins with connecting your vehicle to our computer system scanner. We'll analyze the scanner for any trouble cods that could indicate problems with your vehicle's drivability. We will then review your data against our database of hundreds of AAMCO centers throughout the country. Finally, we'll connect your vehicle to our AAMCO Kwiktest PlusBox to find out if your transmission problem is located inside or outside of your transmission. In addition to your electronic scan, a technician will review all electronic components, including solenoids, sensors, and wiring—replacing them as needed.